Unfortunately for those struggling with chronic halitosis, or anyone who simply wants to get rid of bad breath, there are some prevalent misleading myths on the topic. These myths have been perpetuated for many years throughout our culture, so they can be difficult to dispel, but this blog post series hopes to do just that. Sometimes, food gets stuck in our teeth and we use mouthwash to break up the bacteria that might form because of it. After all, many of our dentists told us to use mouthwash to aid in dental health. Our friends might say “use mouthwash before a date so you have good breath!” And it is true; food frequently becomes stuck between our teeth and that leads to an encrusting of bacteria, which can produce foul-smelling odors as the food decomposes. Unfortunately, this is something mouthwash cannot fix. In fact, most mouthwashes will actually exasperate the issue because the alcohol dries out the mouth and then your saliva glands cannot remove pre-existing or newly-forming bacteria. For dental care, mouthwash is still necessary and should be used - preferably an alcohol free mouthwash that promotes saliva production; however, do not rely on it to be one of your bad breath remedy. Cupping your hands and blowing into them to check if you have bad breath is an extremely ineffective and unreliable way to assess the odor of your breath. this is because your olfactory sense grows accustomed to the smells immediately nearby the nose, so you simply cannot smell your breath. A more reliable way to check for bad breath is to lick the back of your hand. Wait about 15 seconds for it to dry and then smell it. If it smells strange, you very well may have a breath problem. Diagnosing bad breath is the first step to cure bad breath and from here, you can find effective bad breath solutions to the problem. Common bad breath solutions you may hear may sound like “brush and floss your teeth more!” but these sorts of statement are ignorant to the real issue. The majority of my patients practice very good oral hygiene. Their chronic halitosis is typically linked to a genetic or physiological issue. Now, it is very clear that after consuming some onion or garlic one’s breath may temporarily smell like that item and some foods actually produce a strong odor as our bodies break them down, but this is a temporary issue. When talking about halitosis, or chronic bad breath, certain foods – like garlic or onions – are not the root cause. Avoiding those foods is not a way to cure bad breath for chronic sufferers of halitosis. You can cure bad breath and chronic halitosis... the trick is diagnosing the root cause. If you suspect that your halitosis is something more than the occasional case of morning breath, I encourage you to seek out treatment at a clinic specializing in bad breath. 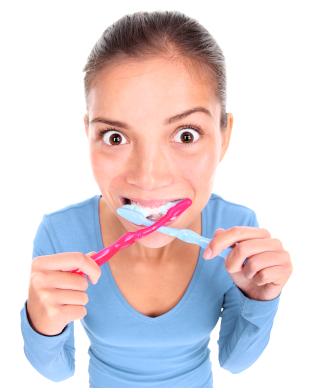 If you cannot make it to a physical clinic, there are a number of home treatments for bad breath worth looking into. Receive a free phone consultation regarding your bad breath problem by calling 1-888-373-7403. Stay tuned for the next blog on the REALITY behind these bad breath myths. About the Author: Dr. Anthony Dailley has been practicing dentistry for over 30 years and conducts research pertaining to bad breath treatments and remedies at the California Pacific Lab. Dr. Dailley holds a degree in Cell & Molecular Biology from San Francisco State University as well as a dental degree from the University of the Pacific School of Dentistry. Dr Dailley specializes in curing chronic bad breath and founded the nationally acclaimed Center for Breath Treatment. I'm reading: Top 5 Bad Breath Myths DebunkedTweet this! I agree with the article. Diagnosing halitosis is not as easy as blowing into your hands and smelling it. There are some procedures and processes being used by the dentists to diagnose severe bad breath. There maybe a self-diagnosis tool to use but it's not that reliable. It's still very important to consult your dentist to ensure healthy and fresh mouth. A more reliable way to check for bad breath is to lick the back of your hand. Wait about 15 seconds for it to dry and then smell it. Choose the right treatment for the condition by consulting with a dentist. You need to be aware of what suits you. I have to agree with you that there is cure for halitosis and the most important thing to do is to find the root cause. It's important as well to maintain a good oral hygiene. I'll be sure to share this since some of my friends have bad breath. Thank you and have a nice day. According to my dentist in Moncks Corner, learning the cause of one's halitosis is not as easy as it sounds like. It is still best to regularly schedule an appointment with your dentist for cure. Dentists in Bartlett say that mouthwash can indeed help fight bacteria in the mouth to prevent bad breath. But if you have halitosis, it is best to visit your doctor for treatment. It's better to consult a dentist Newtown Square PA first before trying remedies to halitosis. Like what Marco said, finding the root cause should be the first step to find cure. I agree completely with this post. It’s annoying to speak that even your self could odor a stinky odor from your mouth. Making your breath fresh will help you ease your self to a total comfort that you simply require. These are very sensible myth busters. I totally agree with all of this because my Buckhead dentist have already shared them. I would just like to add that it's important to drink plenty of water to prevent bad breath. This is a great information. I have to agree with you that you have to regularly brush your teeth and leave your mouth clean to avoid a lot of oral problems. Thank you so much for sharing this one. I think the worst myth is when you try blowing into your hands and smell it. It doesn't work, not even one bit. Dental marketing is one of the online marketing campaign done by the dentists. They wanted to encourage people to have a dental care to avoid bad breath. By the way, thanks for these 5 bad breath myths. These are helpful for everyone! Brushing your teeth 3 times a day and having a regular dental check up will always be the best way to keep your teeth clean and healthy which on the latter part would avoid you from having bad breath. I have a problem with bad breath for years. Your treatment bad breath, it as excellent and harmless. It will help me of those problems. Thank for the detail.